Everyone has that one favorite TV show that came along at the right time with the perfect storyline and characters to leave them totally devoted, defending it from detractors and rewatching until whole episodes are memorized. Some were all over “The West Wing” when it debuted. For me, it was Gilmore Girls. It’s obvious that I’m not alone. Between the breaking-news-bulletins over the announcement that the series would be revived by Netflix and the popular podcast Gilmore Guys, it’s managed to remain relevant in pop culture even almost ten years after it went off the air. Some of the jokes haven’t aged well and references are laughable now for how dated they are (never forget that Howard Dean moment in season four). Even so, for me, the show is like a warm bowl of homemade soup, comfortable and familiar. I’ve watched an episode or two after scary movies to make myself feel better. Sure, no one in real life talks in quips and casual pop culture references — at least no one who isn’t trying to talk like a fictional character — but that just makes me love my escape to Stars Hollow even more. I was the same age as Rory when the series started and now that I’m nearly the same age as Lorelai, I see the show from a new perspective. Still, my favorite character has remained the same: the funny, sunny, talented Sookie St. James, played by Melissa McCarthy (Kelly Bishop as the matriarch Emily Gilmore is a close second). Her character was the rare positive appearance of a fat person on television. Almost all other characters, especially at the time, were in the Fat Monica vein: cheap jokes and stereotypes. I’m convinced after living through the early aughts as a fat teenager, the age of low-rise jeans and bellybutton rings, that I can survive anything. My personality is more in line with the showy, outgoing Lorelai than the quiet, serious Rory, and I was still years away from any sort of self-acceptance. Seeing a character on screen who looked like the grown up version of myself, living her life without any hangups about her appearance was not a small thing, even if I wasn’t fully aware of it at the time. Credit must go to the show creator Amy Sherman-Palladino for no subplots about Sookie trying to lose weight or side comments from Sookie wishing she could change her body. Her weight was never a topic of discussion at all. An early characteristic of Sookie was exaggerated clumsiness. In the pilot, before we ever see Melissa McCarthy on screen, we hear her. To be accurate, it wasn’t quite her so much as a clatter of pots and pans from a commotion she caused in the kitchen. Sookie cheerfully moves on, a clumsy-person cliché. Thankfully, this klutziness didn’t stick. Instead, the running jokes became more about Sookie’s obsessive attention to detail and the pride she takes in her work. When Lorelai and Sookie have their first major fight over possibly going into business together, Sookie holds her own and makes the flighty, emotional Lorelai promise that she’ll stick with their plan. Throughout the series, it wasn’t Lorelai with the stable family life, but Sookie, and it depended on her income. The best lesson I learned from Sookie was about love. There’s a moment halfway through the first season where Lorelai, in a moment of annoyance, says to Sookie, “When did you become a relationship expert? You haven’t been in a relationship in years.” Lorelai immediately apologizes and Sookie forgives her, but it was obviously a painful remark. It also inspires her to do something about it. Later in the episode, Sookie asks her produce man, Jackson, if he’d like to go to dinner with her and he accepts. Rejection was far and away my number one fear as a teenager. Teased by my classmates, I felt constantly rejected and unwanted, but that’s not the same thing as actual rejection. The thought of being brave in this way terrified me. It wasn’t until years later, as I got closer to Sookie’s age, that taking the initiative lost its terror and became empowering. It feels good to take control of your destiny. The best part for me, though, was the scene in the kitchen. 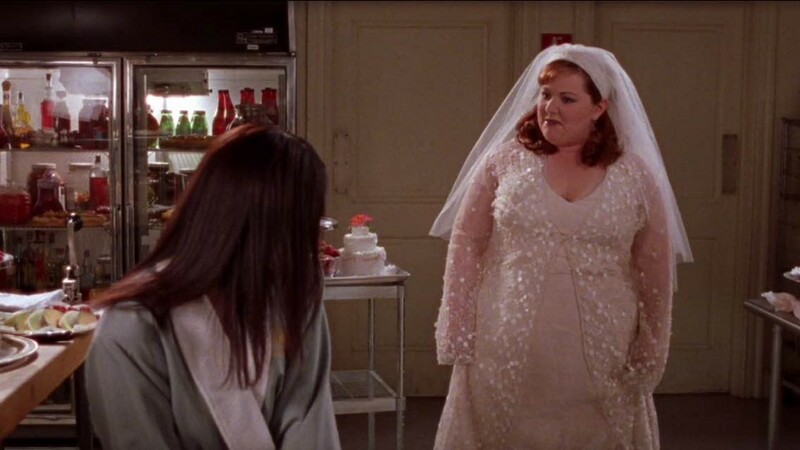 Lorelai walks in on Sookie in her wedding dress redecorating her own cake in a fit of night-before-nervousness. A bad dream had her trying on her dress and veil before zooming down to make adjustments to her wedding cake. The two friends have a touching moment as Lorelai calms her down. Before leaving the kitchen, Lorelai says, “Hey Sookie.” “Yeah?” her friend responds. “You’re in your wedding dress.” Sookie looks down at herself almost as if just realizing she was wearing it. “I am.” “You’re beautiful,” Lorelai says, while Sookie beams. It’s such a funny, sweet, real moment that never makes the joke about Sookie getting married, the kind of scene that even in a state of teenage anxiety could make me think I might possibly meet my own Jackson someday. That imperfect, chubby me might get married someday and it wouldn’t be a punchline. It’s been more than fifteen years since “Gilmore Girls” debuted and there hasn’t been a character quite like Sookie, even if her role lessened toward the end of the series. The British program “My Mad Fat Diary” is great, and definitely a big step forward, but what made Sookie special was that she was an adult, someone who wasn’t still going through a struggle of self-acceptance. I’m sure this whole thing has be strange for Melissa McCarthy herself, whose own weight yo-yo-ed during the series. She’s opened up in recent interviews about losing fifty pounds for the upcoming Ghostbusters movie while at the same time, Elle magazine chooses to use a close-up photograph for her cover. It has be weird for McCarthy to go back to the Stars Hollow set, but this fan is glad she’s doing it. Andrea Laurion is a writer and comedian from Pittsburgh. She’s probably drinking coffee right now.